Researchers from Oxford University and the United Nations University World Institute for Development Economics Research (UNU-WIDER) have found that during the last four decades global income inequality decreased substantially in relative terms, but increased markedly in absolute terms. The study, published this week in the Review of Income and Wealth, shows that relative global inequality (the blue line in the graph below), measured by the Gini coefficient, which takes the value zero for the most equal society and one for the most unequal society, has declined steadily over the past few decades, from 0.739 in 1975 to 0.631 in 2010, driven primarily by declining inequality between countries arising from the extraordinary economic growth observed in fast developing countries, such as China and India. This trend has been achieved despite an increasing trend in inequality within countries. 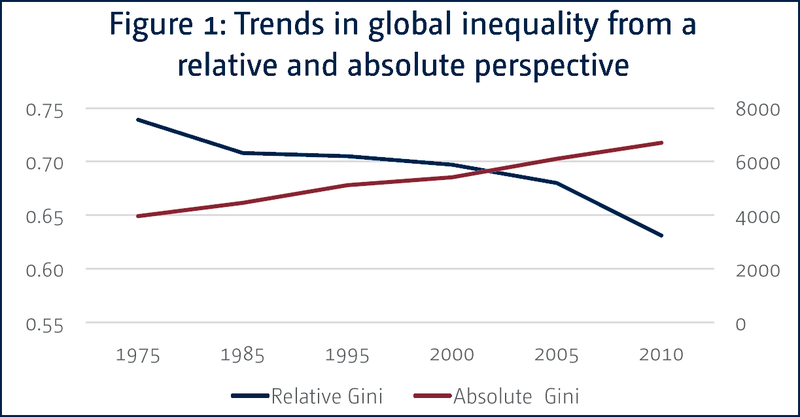 In contrast, absolute inequality, measured by the absolute Gini coefficient and depicted by the red line in the graph, has increased dramatically since the mid-1970s. Over the past 40 years, over one billion people around the world have been lifted out of poverty, driven largely by very substantial growth in income in countries such as China and India. This growth has been accompanied by a striking rise in absolute inequality, but it has changed the lives of many people. The study, which employed data from UNU-WIDER’s World Income Inequality Database (WIID), also found substantially different trends in inequality across different regions of the world. For example, inequality, both relative and absolute, increased between 1975 and 2010 in North America, Europe and Central Asia, South Asia and sub-Saharan Africa. Absolute inequality rose in Latin America, East Asia and the Pacific, but fell according to relative inequality measures. Within regions there was also considerable variation with respect to levels of, and changes in, domestic inequality over the period of analysis. For example, in Europe, the United Kingdom experienced an increase in relative inequality of 38%, while France experienced a reduction of 16%; in Latin America, Argentina saw an increase of 25%, while Brazil witnessed a reduction of 10%; in South Asia, Bangladesh experienced an increase of 60%, while Nepal saw a reduction of 38%. What should policy makers take away from these findings? The divergent nature of the trends in inequality obtained from relative and absolute inequality measures poses some important questions for policy makers. One notable implication is the important role which convergence in global incomes plays. Declining relative inequality between countries has been the main factor in reducing global relative inequality. Yet insufficient convergence, together with substantial growth in per capita incomes, has meant that the increased absolute differences in mean incomes between countries have resulted in increased absolute notions of global inequality.